I am very honored to be the founder and director of the Washburn Blackbox Acting Program since 2008. The focus of acting class is to develop original work based on your own life experience. 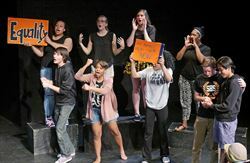 Students gain skills in: improvisation, script work, character development, vocal projection, relaxation techniques, playwrighting, & poetry. Students will also develop skills that enhance creativity, self discipline, and cultural awareness. Professional/Educational background: I worked in the Blackbox Acting Program at St. Paul Central High School from 2004-2008, working with my mentor, Jan Mandell, to develop the tools and skills to create original theatre with young people. I earned a B.A. in Theatre Arts from the University of MN, Twin Cities- focusing in performance and social change. 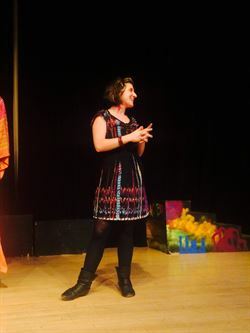 I have performed and directed in the Twin Cities community since 2003, using theatre as a way to create cross cultural dialogue, as well as an educational tool for young people and adults. FEEL FREE! To contact me with questions regarding Washburn's Acting Program!!!!! !